We are excited to invite Caroline Gardner to take part in our new blog initiative Behind the Brand so you can find out more about their latest ranges and what they have planned for the year ahead. It all started for Caroline Gardner in October 1993. Caroline had been working in London as a painter for 5 years after studying at Chelsea College of Arts, when she had a serendipitous meeting with a neighbour, a gallery owner. A designer had let her down last minute, so asked if Caroline could make some cards for the Conran Shop in Japan. The first batch of 70 cards sold out within 2 days and Caroline was asked for 600 more! From then onwards, the company grew! Firstly, in Greetings card and paper products and then a move into Accessories and Stationery. We now have a flagship store in Marylebone high street and ship our products worldwide. 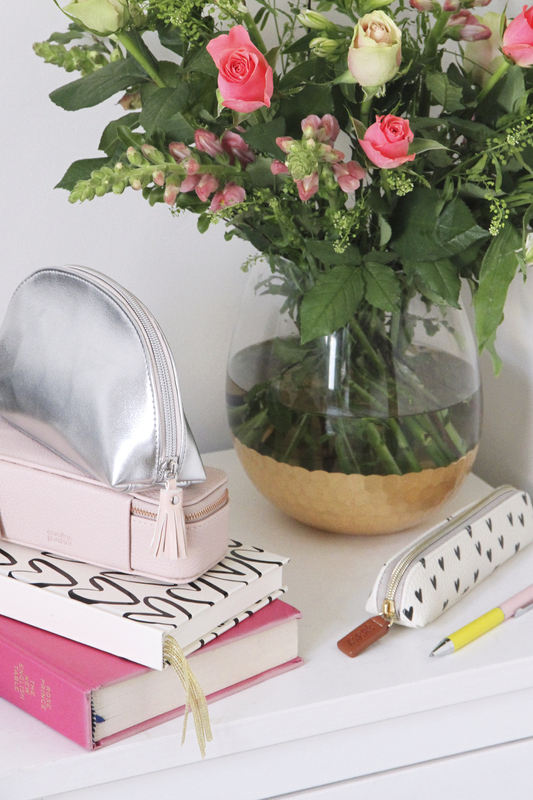 Caroline Gardner is now best known as one of the UK's leading and most prolific accessory, gift and stationery designers. What are your top products this year/set for 2020? We had such a good reaction to our faux fur clutches and purses in AW18, we have brought in new colourways for 2019. We think faux fur will continue to be a must have item and these new colours will not disappoint! To sit along nicely with this is leopard print which we see still to be a print of growth! We have featured this on pens, cosmetic bags and much more for 2019! Handy items are a real trend at the moment, anything to help organise or is a pretty photographable item, such as our new food journal! Could you tell us about your latest collections/ranges? 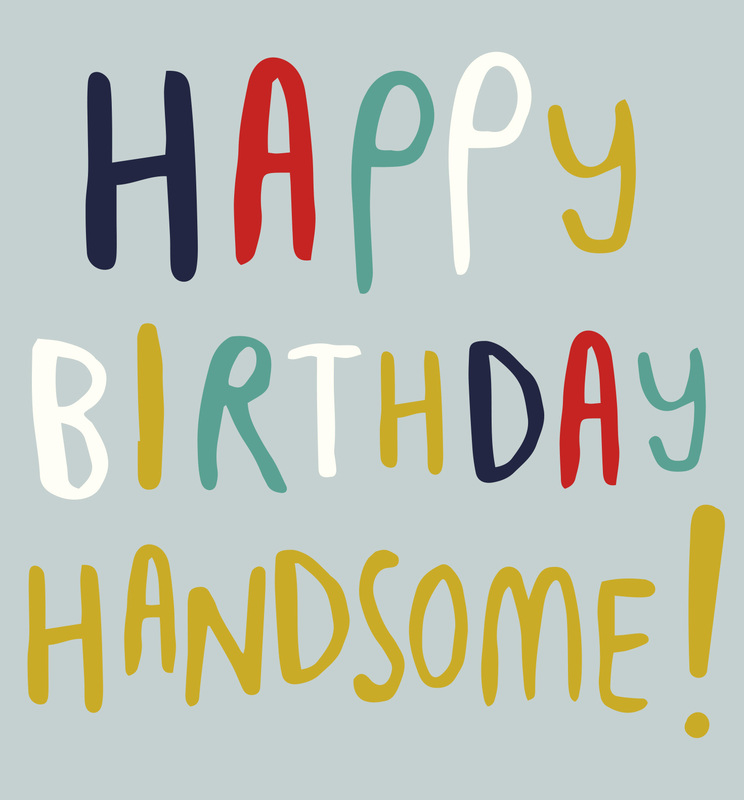 For cards we are really excited to launch some new men’s cards. We have two ranges coming out in July with our target audience focused entirely for men. The first range of cards feature key captions in a masculine colour palette, whilst still having the Caroline Gardner style. The second continues our monochrome theme, featuring unique, bold, hand drawn animals with birthday slogans. We have continued adding neon finishes to our cards, due to the success of our existing ranges with neon. ‘Good Vibes’ is young, fun and fresh. 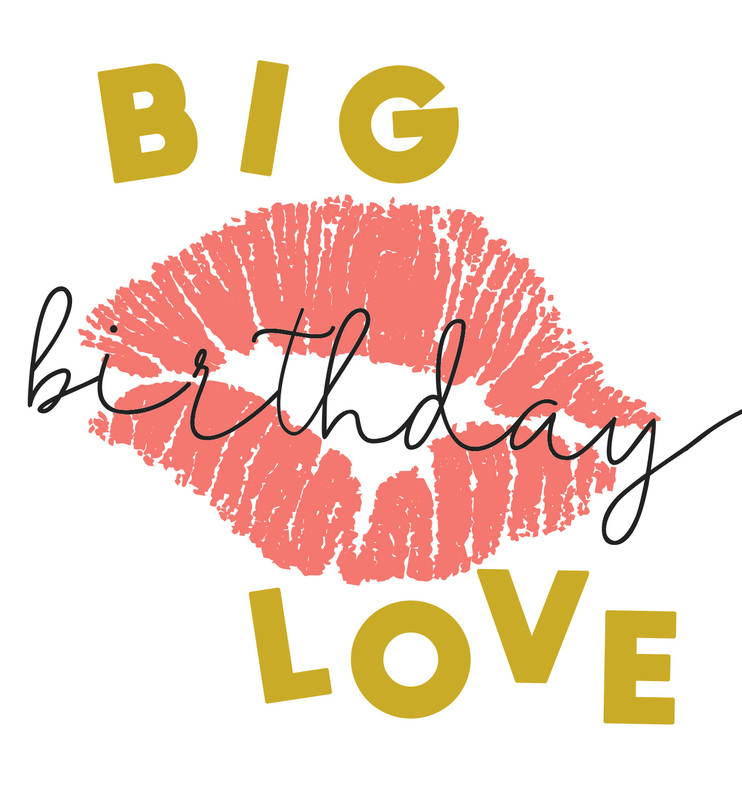 It ties in well with our gift range of bold colourful typography and fun sayings for all occasions! Please see the last bullet point below for the newness in our gift ranges. Caroline Gardner is known for her distinctive style. This is due to the colour palette used across all product categories, and her quirky placement of patterns and designs. She has an ever-evolving style that is modern yet classic. Caroline’s passion is derived from using the finest beautifully designed products. This passion is the driving ethos behind each item produced in the design-led company. Product quality and innovation sit alongside her passion ensuring beautifully design products are continuing to be launched. 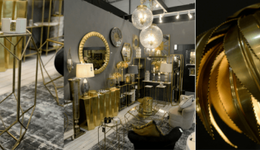 What can we expect from you at Home & Gift 2019? At Home and Gift, we are launching some very exciting new look prints for Caroline Gardner. There is a lot of monochrome in our iconic heart print and new to this season leopard print, which we have teamed with bold, colourful typography. We have grouped this with great pick up items in fun bold colours such as our best-selling key rings, pens and new notebooks. Also new to this season will be a new colourway for the glitter. We have seen great strength in the gold litter products we are rolling this out to silver glitter on a new shape jewellery box, card holder and pencil case to name a few. Lastly, we are continuing with the popular blush pink and emerald green accessories that have been a must have for SS19. 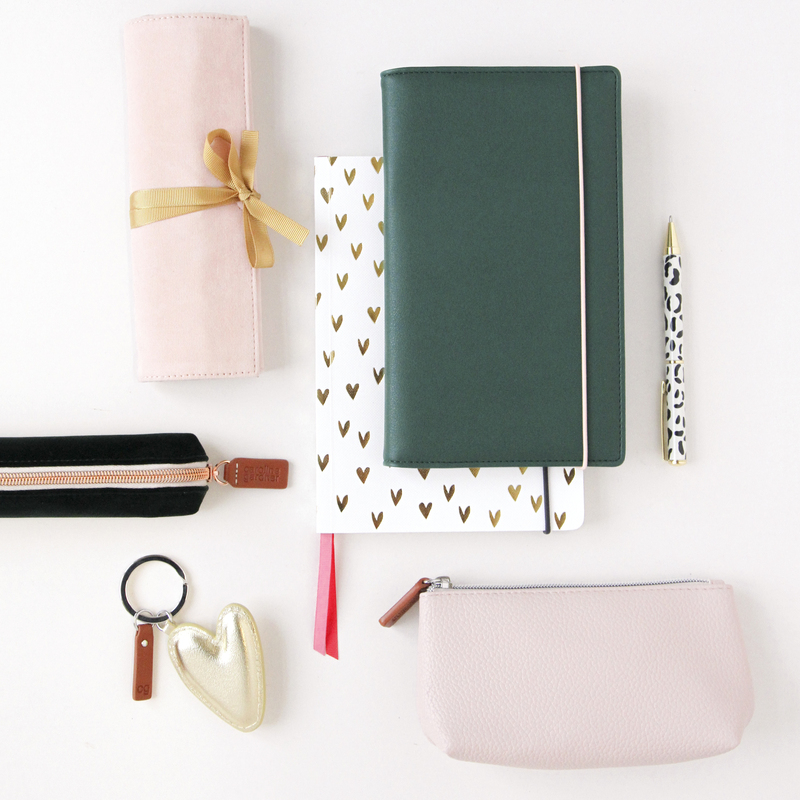 New products include a velvet washbag, jewellery roll and multi tab notebook.